That’s a great article. I’ve always wondered about that phenomenon. They usually got people sucked in because the first volume you got would be totally free and would enter you in some sort of $100,000 sweepstakes (did I mention the free gift as well?). After that, they’d keep sending you one volume a month until you cancelled. Judging by the piles you see around the homes of the older Reader’s Digest set, I’d say most people took 1-2 years to realise they were being gypped and cancelled the subscription. 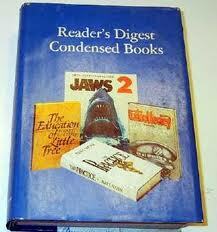 there is a lot of snobbery about readers digest condensed books. i’ve read both the original and the rd version of several books, and often find the rd version either preferable or indistinguishable, but always quicker. people rubbish them without even reading them, just assuming some sort of sacreligious destruction of the original has taken place. these condensations have mostly been undertaken in a thoughtful and skilful way by professionals, and generally approved by the original authors (though i’m not sure what the recompense is to these authors-they may be talking through their hip pockets). i collect both the fiction and non-fiction varieties. if you want to find out about something in detail, without getting snowed under, the encounters books are fantastic. on the fiction level, i recently read “the camerons” by robert chrichton, loved it, and have sourced the original novel to read at some time in the future. i prefer the rd version of “guernsey book club….”, and the original version of “mystery of the dog in the night time”. i could go on but in summary i believe the rd condensed books suffer much of their criticism due to ignorance, which is ironic since they are a great source of knowledge. I wish I knew where I could purchase some!